One indispensable ingredient to make a journey or a stay agreeable, and to make us want to come back anywhere, is good food. There is hardly any cuisine from the world that is not represented in Japan, but the Japanese cuisine that is particular to Kyoto is not easily found outside town, let alone outside the country. Where there is a Buddhist temple, particularly if it is of the Zen school, where there is an estate that used to belong to the aristocracy, there is bound to be a Japanese patisserie or a restaurant connected to that place, with a history as long as that place possesses. The patisseries that are found near the temples are usually those holding the special privilege of serving their cakes to tea ceremonies inside the temple. In the same way, vegetarian restaurants, serving a cuisine called Shoujin, that are near or inside those places of worship and religious practice, are those which principal duty is to cater to the vegetarians monks living inside the temple. Abiding by the rules pertaining to food meant to be served to the clergy, those restaurants and patisseries have refined and updated their own special taste, culture and tradition, thus gaining respect and popularity among the lay people of today as well. Tofu restaurants, patisseries and vegetarians restaurants are abundant around JIJUDEN, but it takes only a little knowledge and a few steps to discover the many other delicacies Kyoto has to offer. If you are staying here for only a few days, you only have to ask and we shall be more than happy to advise you beforehand and make reservations on your behalf. Just next door to JIJUDEN is the old soba noodles Gontaro, famous for its sweet and weighty soup stock, a unique taste often synonymous with Kyoto cuisine. In the cold season the thick udon noodles and rice bowl meals are also very much in demand. Sample this palatable fare while enjoying the small Japanese garden and the cozy atmosphere. Branch of the Wakuden of the Kodaiji temple. A ryoutei that serves Tenzo cuisine (Tenzo being the title of cooks in temples), and which is another kind of temple vegetarian food, using not a single ingredient of animal origin. By reservation only. The restaurant cannot serve more than 5 meals a day. The shop on the first floor sells its famous "Seiko" lotus root cakes. (3) Shojin restaurant "Daitokuji Ikkyu"
One of the oldest Shojin cuisine restaurants, established in the 15th century, said to have been named by Ikkyu-san himself (see Daitokuji on Location page), and which serves such staples as Daitokuji Shoujin Ryouri (or shoujin cuisine), Daitokuji Natto (or fermented soya beans) and Daitokuji Fu (or bran), which are all registered trademarks. By reservation only. (4) Shojin (temple vegetarian) restaurant "Izusen"
Daiji-in is one of the sub-temples of the Daitokuji temple complex (see Location page), and Izusen is famous for its highly elaborated Shojin cuisine (a culinary art that originated in the meatless diet of Buddhist monks) and for serving it in bowls shaped after the monks’ begging bowls. 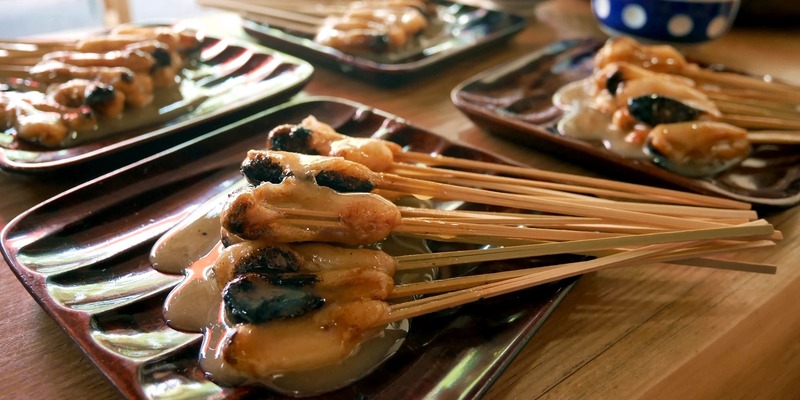 Broiled on skewers in sweet white Miso paste, this is one of the secret spots for Kyotoites with a sweet tooth. Facing each other across the lane leading to the shrine are “Ichiwa”, established 1000 years ago, and “Kazariya”, established a mere 400 years ago, and which competition has spurred them on to hone their art throughout the centuries. Do not hesitate to sample from both shops and be the judge of the day! (6) Japanese patisserie shop "Matsuya Tobee"
Located in the vicinity of the Daitokuji temple complex, Matsuya Tobee is a Wagashi shop established after the Edo period more than a century and a half ago, and which now supplies its cakes to grand tea masters and tea ceremonies in Daitokuji . Made with sweet white miso paste and natto (fermented soya beans), the Murasakino Matsukaze cake is famous for its rich taste and soft texture. (7) Japanese pickled vegetables shop "Daiko"
Adding as little salt as possible so as to draw all the flavors from the vegetables, Daiko is famous for producing pickled stuff that is both light and subtle in taste. Soaked in kelp and white soya sauce, the pickled aubergine remains one the staples of the shop. (8) Shoujin (temple vegetarian) cuisine "Ajiro"
Holding its prerogative to serve the nearby Myoushin-ji temple very earnestly, Ajiro nevertheless opened a shop in front of the temple gates to serve those customers who wished to enjoy Shoujin cuisine in a less formal manner than the custom usually requires to. Never swaying from the basic principles of simple Shoujin cuisine, Ajiro proposes gorgeous full courses composed of such vegetarian staples as tofu and yuba, sometimes called tofu skin abroad. (9) Boiled tofu restaurant "Seigen-in"
Established and managed by one of the sub-temples of the Ryouan-ji temple, thus allowing its patrons to eat within the walls of a World Heritage monument. Famous for their kinu (cotton) tofu, soft to the tongue as cotton is to the touch, for their raw wheat gluten dishes and for their tofu flavoured with the seven traditional herbs (Water dropwort, Shepherd's purse, Cudweed, Chickweed, Nipplewort, Turnip and Daikon or white radish). Opened till 5 P.M all year round. (Kamihichiken) Japanese patisserie shop "Oimatsu"
Established in 1910 in Kamihichiken, the oldest entertainment district of Kyoto. Many are the Wagashi shops in town, which could claim with equal right to represent the taste of Kyoto. Among them stands out Oimatsu and its Natsukanto, a cake made with Chinese citron and agar gelatine, which the local people of Nishijin district often buy as a gift. In a relaxing and serene space, steakhouse YU offers "Kuroge Wagyu" (the finest selection of Japanese beef), cooked on the counter by the chef right before your eyes, while you wait with a glass of wine in your hand. The meat melts on your tongue and its tenderness and juiciness makes it a true delicacy. Established in the old entertainment district of Kamishichiken, Koubai-an started by providing meals to tea houses. People in the local Nishijin district still like to use their services when they are in need of a trusted caterer. (Kamihichiken) Sushi bar restaurant "Yoshizuki"
Yoshizuki serves a wide choice of the best traditional Japanese dishes, but its specialty is sushi and its selection of local sake. You can enjoy a relaxing evening in a quiet and modern Japanese style surroundings, while tasting superb food until the clock strikes midnight. Managed by the maker of Japanese sundry goods Kyoto Kurochiku, Kurosuke serves delightful Tofu cuisine in the machiya (wooden townhouse) that used to be home to Yoshidaya, a teahouse of Kamihichiken that opened in the late 1860’s and operated under four successive generations of owners. Shozan is a small town that comprises japanese gardens, a pool, a huge bowling facility, a church, and restaurants. Chinese restaurant "Louran", and "Wakadori", specialized in chicken, are two popular places to eat there. During summer time we recommend the fare at Senjaku. They serve a refined Japanese cuisine which you can enjoy sitting outside on their shaded japanese balcony. Located in the vicinity of Kitano Tenman-gū shrine, Fujino is a long established tofu shop. They also run a casual tofu restaurant TOFU CAFE FUJINO in front of their shop. Established in 1898, Toyouke-chaya is specialized in Tofu cooking and is famous for the rich taste of its tofu and for its dishes of Namafu, a wheat gluten speciality also known and sold as Seitan in the West. Toyouke-chaya also sells its products on the first floor. (13) Awa dumplings shop "Sawaya"
The Awa dumplings of Sawaya have been associated with the nearby Kitano Tenmangu temple (see Location page) ever since the shop was established in 1682. The dumplings can also be enjoyed on site. One serving comprises of 3 bean paste dumplings and 2 soybean flour dumplings, the whole set for a mere 525 yen. The place is often full on the 25th of each month, when the Kitano temple fair is held. (14) Japanese patisserie shop "Sasaya morie"
Sasaya shue is the Japanese patisserie that caters to the nearby Waratenjin shrine, where people and mother-to-be’s pray for safe deliveries. Their famous Ubu dumplings (ubu meaning "fresh","naive" as new-born babies are) are soft and filled with sweet bean paste or sweet fermented soya beans, topped with home-grown soya bean flour, and taste indeed fresh and new to the palate. (15) Wine bar "La Cave"
Impressed by the wines he tasted during his business trips in Europe, the owner decides to open his wine bar and serves wines he selects himself, mainly in France and Italy. Offering foods such as pasta or pizza, the menu also proposes other kinds of alcohol and a selection of cigars. English spoken. Check openings at 075-465-5191. Yutaka is a small and casual restaurant of kaiseki cuisine right beside JIJUDEN. Its chef who practiced in a famous Japanese restaurants will serve you an authentic kaiseki cuisine at a reasonable price for lunch and dinner. (17) Kombu specialty shop "Itsutsuji"
Established in 1903, Itsutsuji has specialized in dry kelp kombu from the very beginning. Kombu is processed kelp and an indispensable ingredient to make dashi, or the stock soup that is the heart and soul of Japanese cuisine. As such, high quality kombu such as sold in Itsutsuji is always a good idea for a gift when you visit a Japanese friend, or anyone who wants to cook Japanese. (18) Soft-shelled turtle dishes "Daiichi"
Daiichi has been serving soft-shelled turtle dishes (Suppon), for over 330 years. The menu is comprised of one unique item: the suppon soup served in a pot and the full course that goes with it. By reservation only. Be prepared to enjoy the ultimate dining experience in Kyoto (and pay for it correspondingly!). (19) Kyoto-style pickled vegetables "Kintame"
Established in 1880, one of the oldest pickled vegetables shops in Kyoto. You can also enjoy a bowl of salted rice in green tea (Ochazuke) with pickled vegetables on the tatami mats in the back of the shop, all the while enjoying the view of the small garden, provided you have reserved beforehand.